Although it’s an unpleasant thought, attic rats are not as uncommon as one would initially think. Rats are nimble climbers and are often able to work their way up into dark, warm attic spaces, which is the type of environment they generally enjoy. If you suspect you’re hearing unwanted rodent visitors scurrying about in your attic, it is best that you try to address the problem sooner rather than later, as attic rats present a number of risks to your home, family and pets. Where Do Attic Rats Come From and Why are They Dangerous? Attic rats usually make their way into the attics of homes through damaged eaves, gaps in the roof structure, and vent openings. 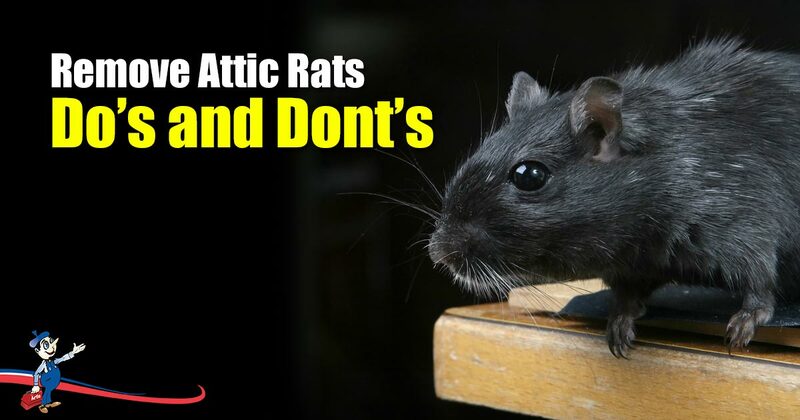 If you can hear scurrying and squeaking at night, become aware of rodent droppings, or notice bite marks on wiring or wood, then it is likely you are experiencing an attic rat infestation. Attic rats tend to breed quickly, which is why it is important to take steps to remove them as soon as you become aware of their presence. They are also unhygienic, and may carry diseases, which could put your family and pets’ health at risk. If left to have free reign over your attic, they are also likely to cause serious structural damage, and may chew through wiring, or gnaw wooden structures or piping insulation. While many homeowners’ first port of call will be to try to poison the rats or set up rat traps, this is usually an ineffective solution. If a few rats have discovered a vent opening or gap in the eaves by which they can enter your attic, the chances are, more rats will do the same. That’s why killing the rats won’t solve the problem – the rats will just keep coming back, and if anything, you’ll be left with an unpleasant odor to deal with. Rat poison is also generally ineffective, because once one rat has become sick from a food source, all the other rats will mark the food source as unsafe and will avoid it. Rat poison is also dangerous, and should be kept out of the home if you have small children or pets. The first thing you can do to avoid a rat infestation is to ensure that your outdoor garbage bins are always closed, that the garbage is removed regularly, and that your attic is cleared of debris to discourage the proliferation of insects which rats eat. Once you’re aware that you have an infestation, the best thing you can do is look for the vent openings and roof areas through which the rats are entering your attic. You will need to hire a professional roof expert in order to detect where the openings are, as it is unlikely you will be able to find all the holes yourself. Once the holes and gaps have been found, these need to be properly sealed with a material which the rats will not be able to chew through, such as steel. Once this has been done, the next step will be to put snap traps in your attic, to kill the remaining rats left inside. You will then need to ensure that the traps are removed to prevent the rat carcasses from decomposing in your attic and causing horrible odors. From time to time, and especially after storms or hurricanes, you should book a roof inspection to check that no new openings or holes in your roof structure have been created. While attic rats can be a terrible nuisance and can keep you up at night, they’re no match for the roof rat experts at Art Plumbing, AC & Electric. We have years of experience in removing rodent infestations and will give you peace of mind (and restore your sleep at night) by sealing up any entry points and removing the remaining rats with traps. Call us today at 1-800-475-1504 if you are experiencing a rat attic problem – our friendly, reliable roof experts will be glad to assist you.